Don't let a distributor register your medical device in colombia and control your sales for ten years. It is strongly recommended that foreign medical device manufacturers process the regulatory registration in Colombia under their name; and not under the local distributor name or else the foreign company will not be able to change or add distributors during the lifetime of the registration, which is 10 years. Most Latin American markets are highly centralized, with anywhere from 60-90 percent of wholesale activity centered in the capital city. However, three countries are not structured as such: Brazil, Colombia, and Mexico. In those markets, it is almost impossible to find a distributor with true national coverage and reach — though they might insist otherwise when you meet them at a trade show. You should consider engaging multiple distributors in a country—specially in Colombia—, divided by region, sales channel, or client category. Exclusivity of any kind should be tied to minimal sales goals. It’s key to conduct due diligence when choosing a distributor in the Latin American region. Many foreign manufacturers loosely choose their distributors at trade shows — relationships that usually start with a fancy dinner end in disappointment when distributors don’t meet their sales quotas. You can’t afford to wait three years to determine whether your distributor was poorly chosen, and nothing inspires performance like competition. If you have multiple distributors in a market, and they are aware of one another’s performance, then your likelihood of success is high. If you are at the mercy of one distributor, your probability of underperformance is worrisomely high. Latin American markets represent 9 percent of the world’s GDP and 10 percent of the global population.2 You should expect the region to capture no less than 9-10 percent of your company’s global sales. Distributor choice also affects your company’s regulatory strategy. Consider the case of Colombia; its national regulatory agency — INVIMA — requires foreign manufacturers to name one importer of record (IOR) and one storage facility (also known as "acondicionador" in Colombia; an entity certified by INVIMA to store medical products) in their registration application. Because of its natural structure, Colombia can be divided into six very distinct natural and cultural regions. These consist of the Andean Region, covering the three branches of the Andes mountains found in Colombia; the Caribbean Region, covering the area adjacent to the Caribbean Sea; the Pacific Region adjacent to the Pacific Ocean; the Orinoquía Region, part of the Llanos plains mainly in the Orinoco river basin along the border with Venezuela; the Amazon Region, part of the Amazon rainforest; and finally the Insular Region, comprising islands in both the Atlantic and Pacific oceans. If you choose a distributor as both, your IOR and your storage facility, you will be limited to having only one distributor in Colombia (as opposed to having several distributors, covering the whole country) and will have no clear separation between your regulatory, logistics, and commercial affairs in Colombia. Thus, it is advisable that foreign manufacturers that plan to have more than one distributor in Colombia, choose a third-party logistics company as both their IOR and storage facility. This logistics company will be able to import and store your product in its INVIMA-certified warehouse in Colombia. As your distributors place their purchase orders with you, the logistics company will ship —upon your instructions— your products to the local distributor of your choice. When entering a new market, it is important to have a solid regulatory, logistics, and commercial strategy. 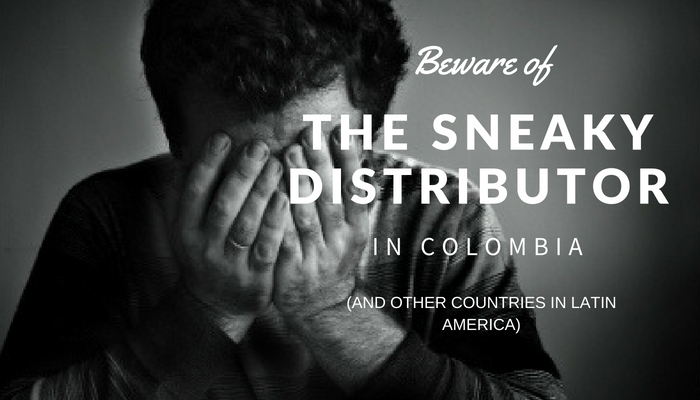 Instead of informally selecting a distributor at a trade-show, you must vet an conduct thorough due diligence to choose a reputable distributor when entering the Colombian market; as the wrong one can lead to missed sales opportunities, poor relationships with end users, and a damaged brand name. It is also important that you preferably obtain market authorization under your company's name and don't let a local distributor take control of your regulatory, logistics, and commercial strategy in a new market like Colombia. About Julio G. Martinez-Clark: Julio is CEO of bioaccess.™—a US-based contract research organization (CRO), regulatory, and market access consulting company that delivers a full spectrum of offerings from bench to commercialization so that foreign manufacturers of regulated products can have long-term success in Colombia and the rest of Latin America. Learn more.